My husband and I had a chance to watch Woody Allen’s latest opus, Blue Jasmine, Friday night, and I came away floored. While I have enjoyed many of Allen’s recent contributions (particularly Vicky Cristina Barcelona and Midnight in Paris), Blue Jasmine falls alongside Annie Hall and Hannah and Her Sisters as one of his strongest efforts as a writer/director. The film is timely but timeless, expertly structured, well written, and beautifully performed. In short, it’s one of the best films directed and written by Allen in his entire career. The film focuses on Jasmine Francis, played to perfection by Cate Blanchett. We meet her flying westward and reminiscing about her marriage to a wealthy financier, Hal (Alec Baldwin). Despite her first class seat, Louis Vuitton luggage, and fashionable aesthetic, Jasmine is broke due to punitive actions taken by the government as a result of her husband’s fraudulent investments. Jasmine’s sister, Ginger (Sally Hawkins), takes her in, despite having been negatively impacted by the investments herself. Both Ginger and Jasmine navigate the rocky terrains of romance as well, with Ginger gravitating toward honest, working class types and Jasmine wanting smooth, wealthy men. This difference in taste causes friction between the two. Like Vicky Cristina Barcelona, Blue Jasmine is a character study through contrasts, but it’s elevated above that earlier effort by thoughtful writing and Blanchett and Hawkins’ pitch-perfect performances. Blue Jasmine isn’t the first time that Allen has written and directed a piece about sisters. 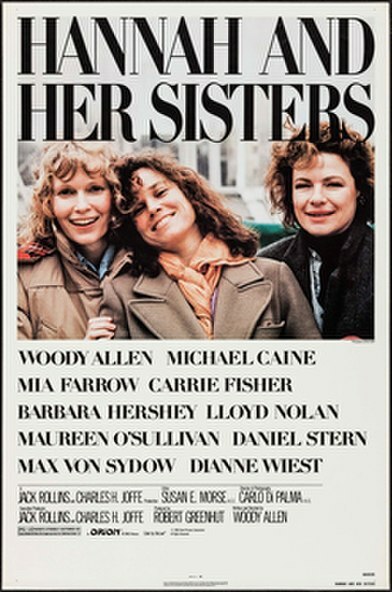 One of my favorite Woody Allen-directed features, Hannah and Her Sisters centers on the dynamic between Hannah (Mia Farrow), Holly (Diane Weist), and Lee (Barbara Hershey), three Manhattan siblings with close but problematic relationships. In that film, Hannah is the center that holds the three together as a result of the stability she’s gained through her successful acting career and marriage; however, both Holly and Lee resent Hannah’s role and, in their own ways, challenge Hannah’s supremacy–Lee acquiesces to Hannah’s husband’s romantic advances, while Holly uses Hannah’s marital problems as creative fodder. By film’s end, Hannah’s dominant position remains, but Holly finds her own artistic voice and both she and Lee find love of their own. In both Blue Jasmine and Hannah and Her Sisters, Woody Allen’s writing and the performances of these amazing actresses capture how dynamics between siblings in childhood reverberate in adulthood; but with both films focusing on sisters, those relationships are impacted by gender. In both cases, it is men that get in the way of the sisterly bond; however, Blue Jasmine incorporates an additional dimension to the contrast between sisters: class. Ginger and Jasmine, despite being of the same parents, exhibit very different tastes, with Ginger choosing the funky, laid-back San Francisco for her home, and Jasmine having previously lived a luxurious life in New York. Their taste in men is similarly divergent, with Jasmine swept off her feet by the smooth, duplicitous Hal, while Ginger opts for direct, working-class guys in her ex-husband, Augie (Andrew Dice-Clay–yes, for real), and fiance, Chili (Bobby Cannavale, my new favorite character actor of the Guido persuasion). These foils reveal interesting contradictions: Jasmine judges Ginger’s men as crude, violent, and ill-educated, but her own husband’s actions have inflicted the most pain. Blanchett and Hawkins portray Jasmine and Ginger, sisters with dramatically different tastes and values. Image taken from Free Press Houston. Here, then, Blue Jasmine questions the social dynamics that allow Jasmine to effectively feign respectability (though the illusion does collapse) while Ginger must defend her choices to her more “refined” sister. It’s an entrancing balancing act that Blue Jasmine plays, one that ultimately tips in favor of the honest sister. And that, ultimately, is what Hannah and Her Sisters and Blue Jasmine share in common: an emphasis on defining oneself authentically, despite the ways in which our familial relationships might pull us back into long established roles. It’s knowing your value outside the family that enables you to survive and thrive. The poster for Hannah and Her Sisters. Image taken from Wikipedia.